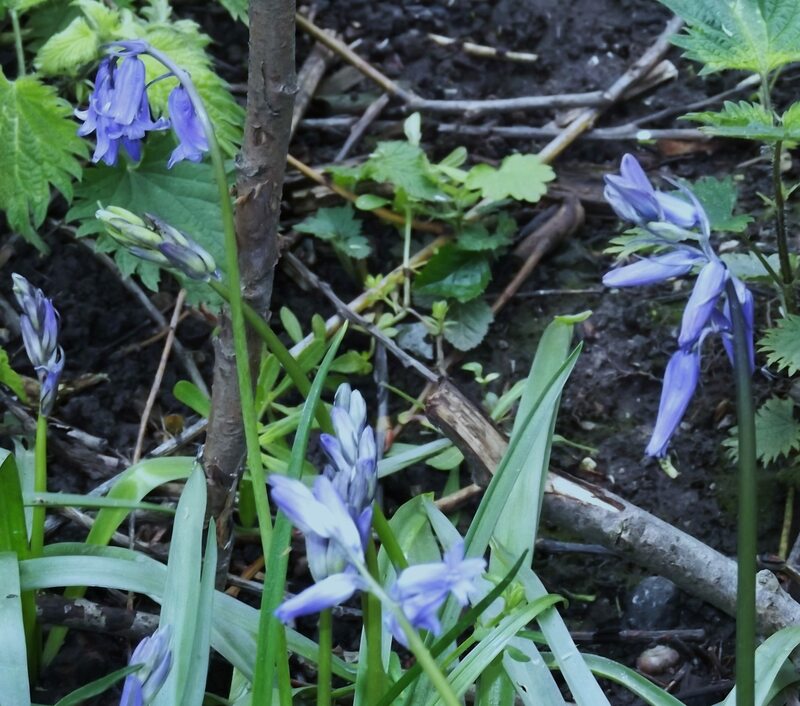 Some of you may remember the English bluebells MCT planted at this time in 2013 from when they flowered in April in the woody area north of the western bund (see photo below). We have just planted another 400, so are hoping for an even better display in 2015 . 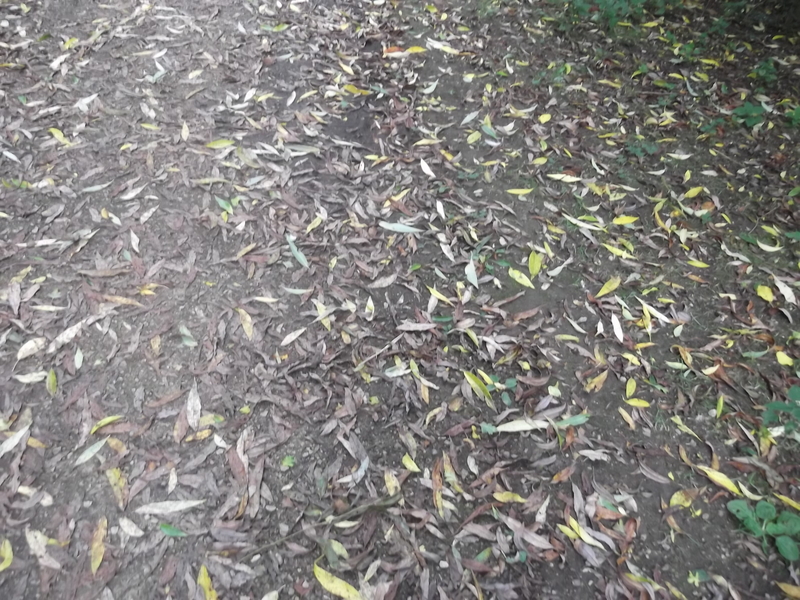 The field work co-ordinator felt a bit like King Canute when clearing leaves off the path at the Little Hob Moor end in late October after the strong winds, but they were already starting to form muddy humus. Taking them off to compost is essential to stop the path reverting to its old muddy state. 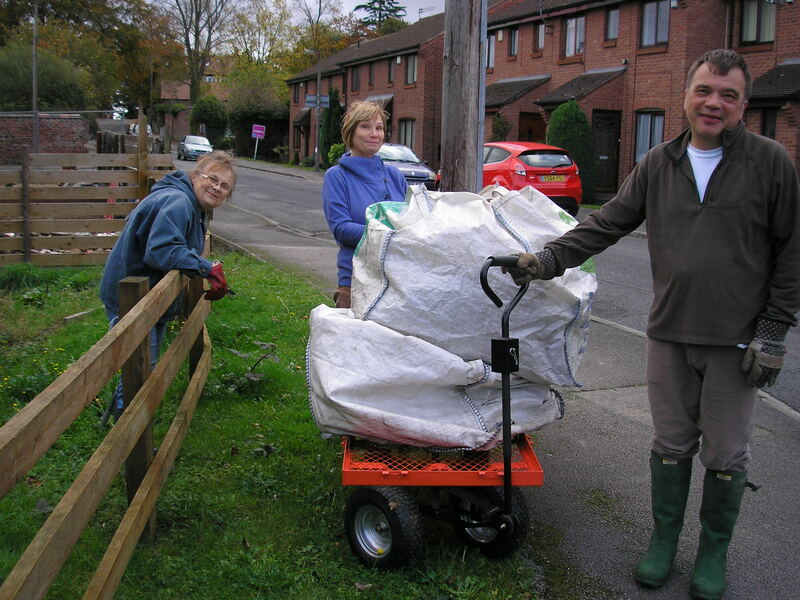 Seven turned out for our Sunday morning volunteer session on 12th October, so we were able to make good progress with removing grassy tussocks and excess knapweed from the wild-flower meadow and with opening up more of a path between the meadow and the grassy area beside Nelsons Lane. 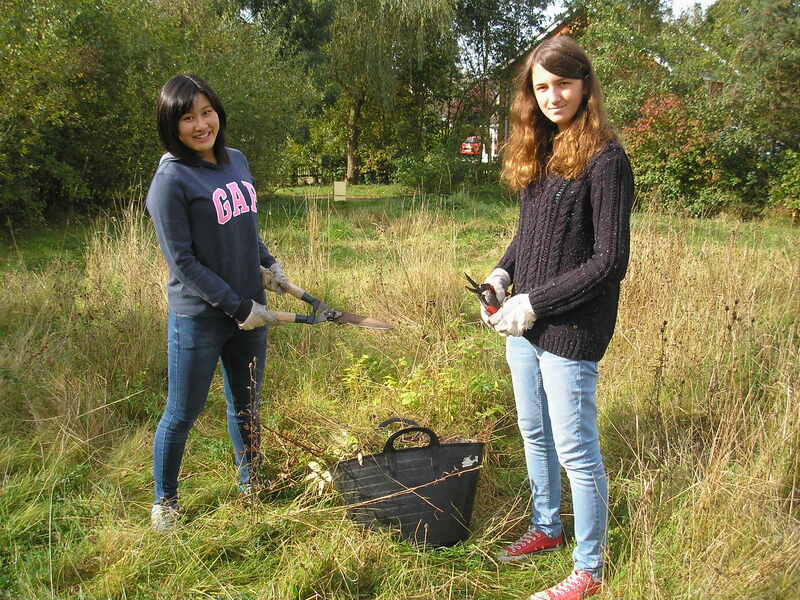 The session on October 19th was even better, with eight volunteers enjoying the October sunshine. 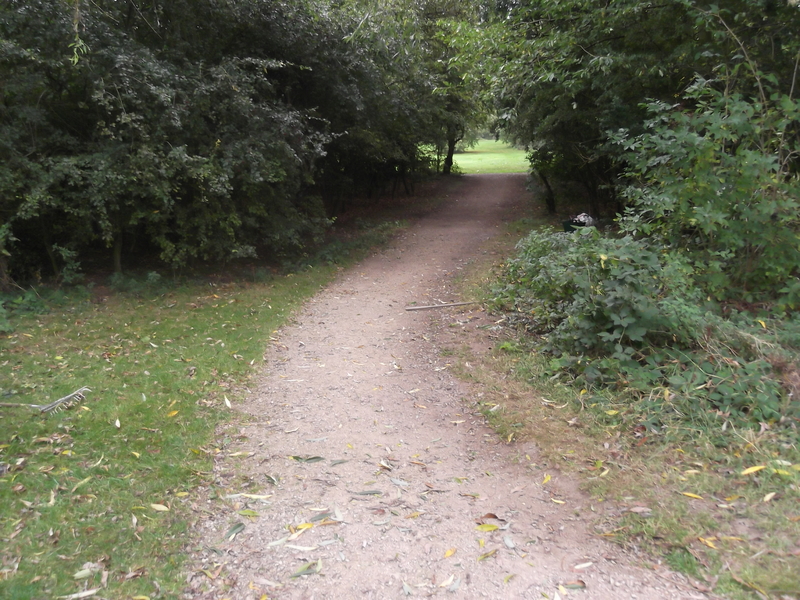 We continued our work on creating pathways through the woodland east of the playground and composting removed willow and self-sown saplings, so it’s now possible to meander through right from the meadow down to the eastern end of the grassy area beside Nelsons Lane. Charlotte and Janet did a great job with Margaret, Pam and Malcolm cutting branches up so they were the right size for composting, while Louise, Lesley and Paul raked up and bagged trimmings from overgrown brambles and nettles cut down by Dave (Moore) and Malcolm earlier in the week behind back gardens of some houses on Hob Moor Terrace. These went on the compost heap (as caught on camera by Pam below). On Monday October 6th, CYC workers braved the elements to install a new gate that opens in both directions at the Nelsons Lane end of the path, as shown below. 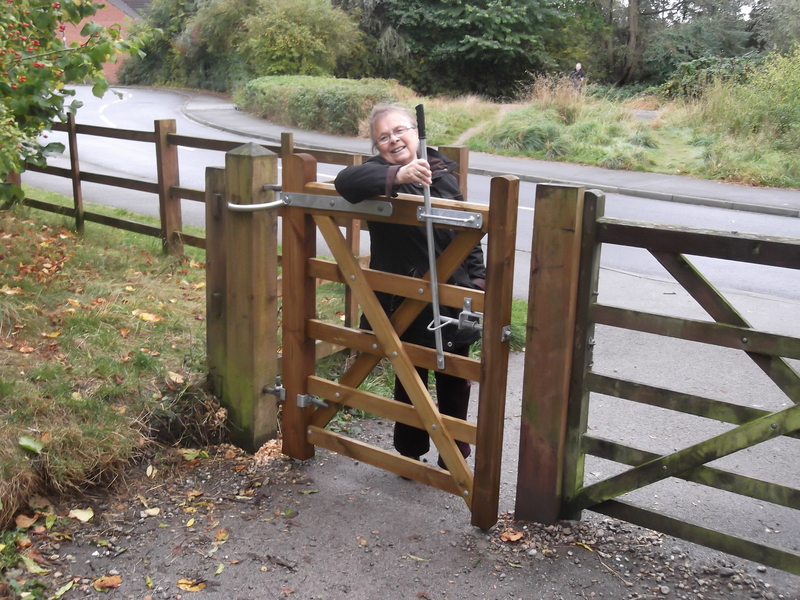 The lever action makes it much easier for walkers, wheelchair users and cyclists to open and close the gate from both sides. Springs shut the gate, which makes it safer than when it used to be left wide open, but don’t lock it automatically. The MCT secretary tries out the new gate mechanism. We were delighted to see Charlotte and Janet join our Sunday morning volunteer session on October 5th. They are both working towards a Duke of Edinburgh award and MCT greatly appreciate their help see (Pam Brown’s photo below). 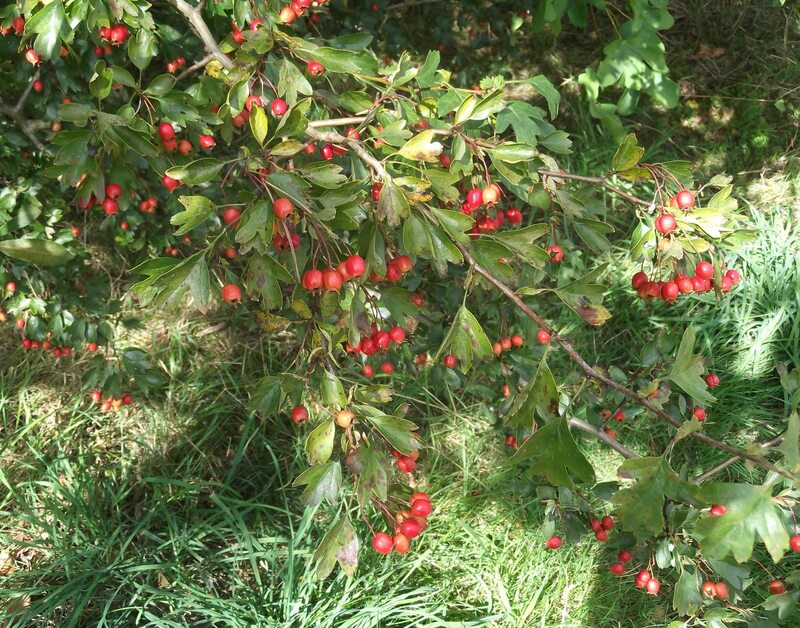 As we have been opening up the woodland beside the playground we found 4 more Spindle trees and noted 2 groups of hollies growing quite well (please don’t snip holly branches off to enhance your Xmas decorations in December though – they are still too young for that!). MCT has trimmed back the surrounding vegetation to improve their growing conditions (light, water and nutrient supply). 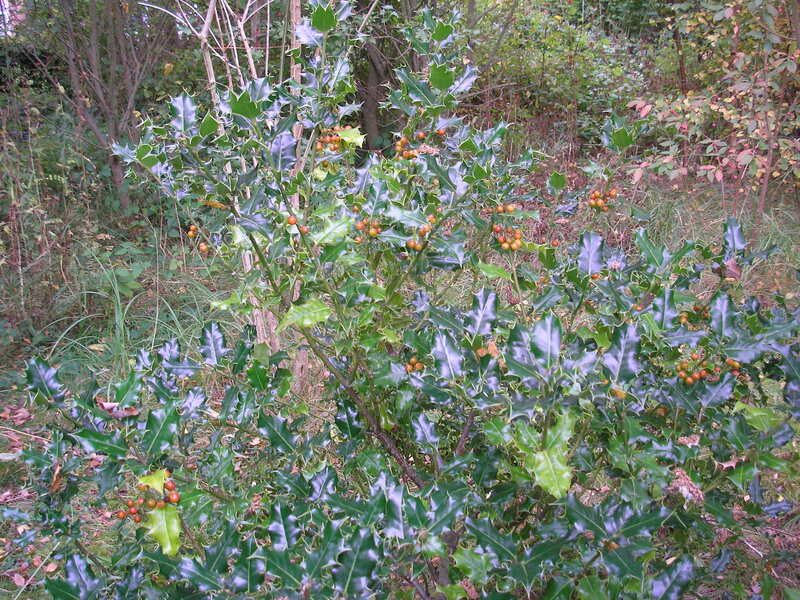 Spindle tree and Holly growing east of the playground in September 2014. At this time of year at both ends of the path MCT volunteers periodically clear leaves before they get too trampled in and turned to muddy humus. They also lightly prune overhanging branches. The before and after photos below show why this is important. 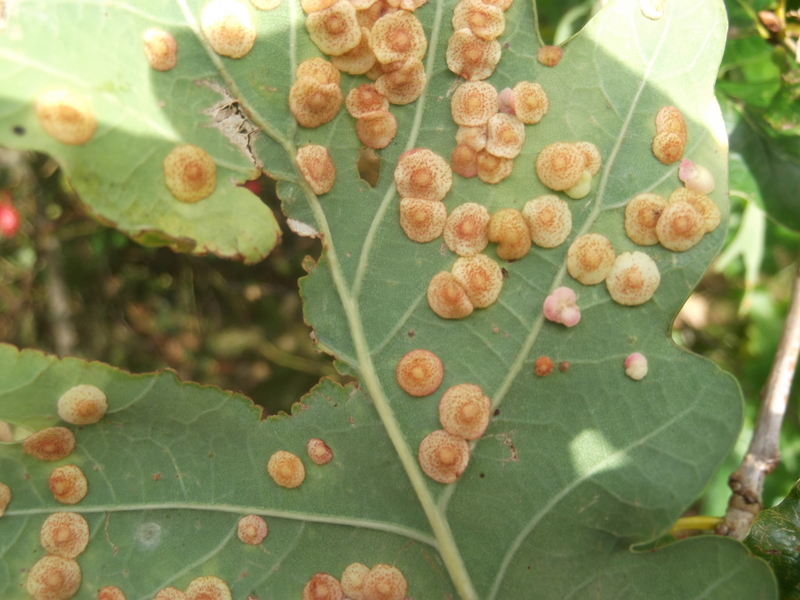 In Autumn last year we noted extensive coverage of oak leaves with the aptly named sequin gall on lower surfaces. It has re-occurred as expected in 2014 (see photo below), but this symptom from gall wasp attack is not regarded generally as a serious threat to the trees. We were surprised yesterday (24-09-2014) when clearing damp brash to establish a path at just how few slugs were exposed. 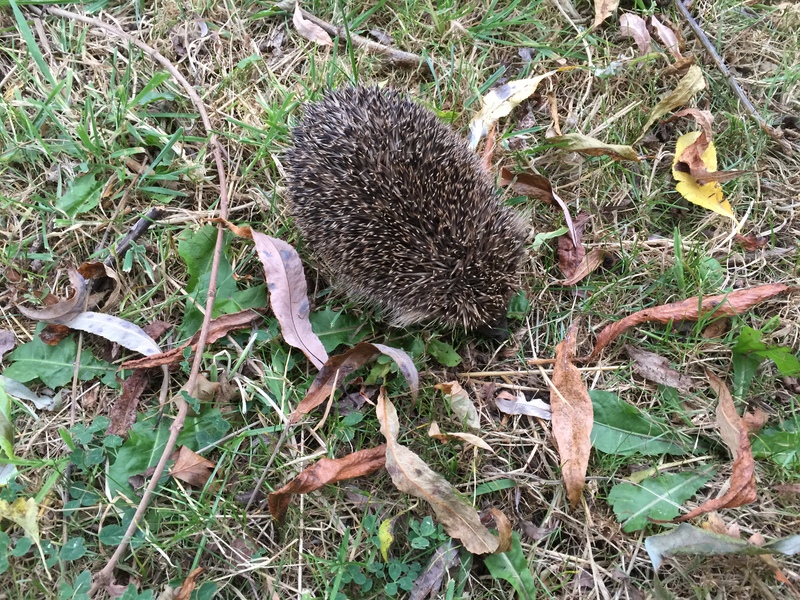 It looks as if our local hedgehogs (one caught on camera out in daylight recently by MCT Chair Magaret Silcock) have been doing a thorough job! 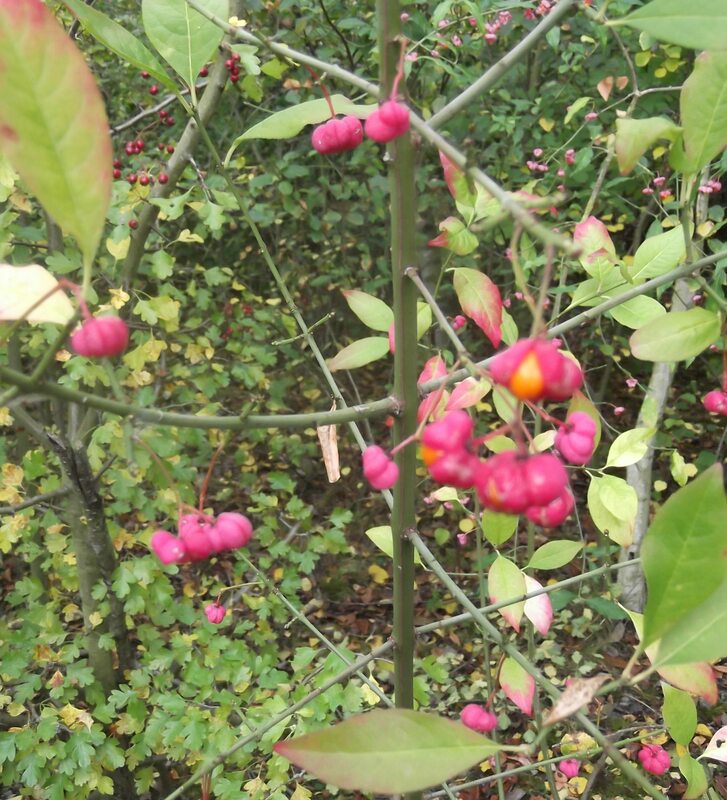 It’s not October yet, but we’ve given in to the temptation to add another autumnal colour picture, this time of a branch of a Spindle tree. We found two young specimens while working in the woodland on the east side of the site, and gave them a bit more space and light to grow. 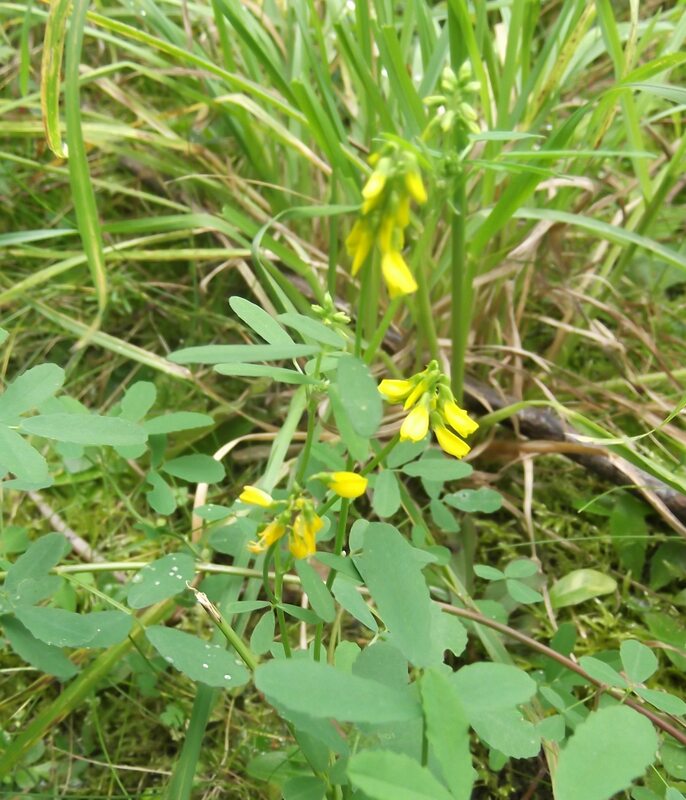 We hope they’ll do well as they should on the calcareous soil on the site and that you’ll like Pam’s photograph. 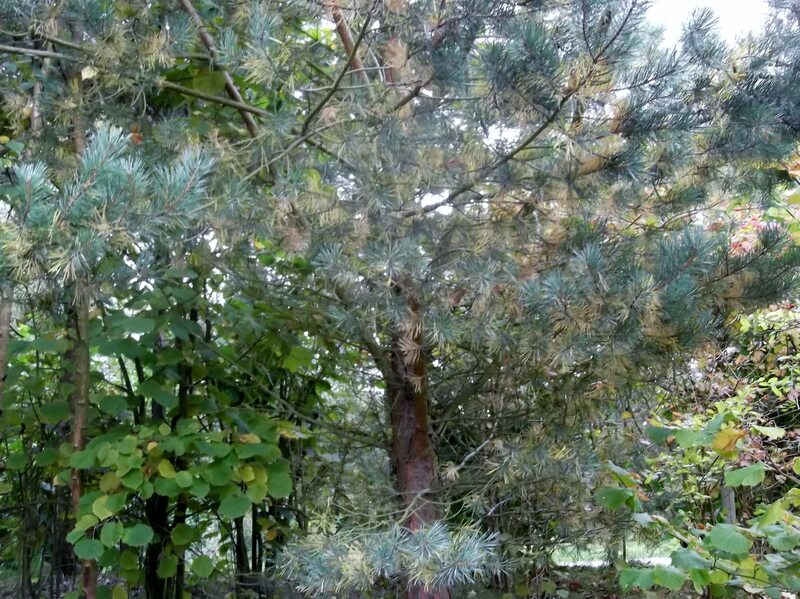 Regular site users may have noticed some quite pronounced yellowing of some needles on many of the Scots Pine trees on the Mayfields site from mid-September, as shown in the photo below. This will result in a heavier than average seasonal needle drop, probably following of water stress associated with the prolonged periods of warm, dry weather this year. It’s hard to believe we’re into Autumn already. 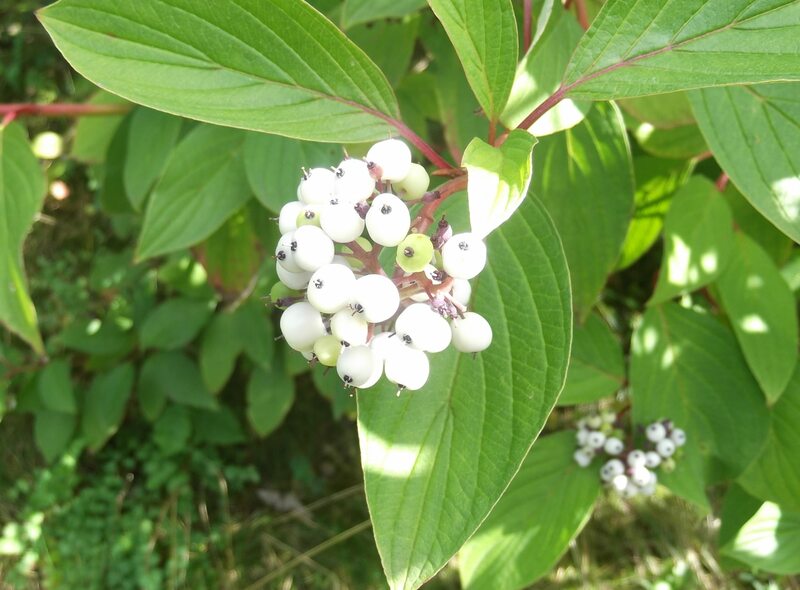 There are less flowers to choose from for our “Wild-flower of September”. Red clover, black medic, red campion (in the shade! ), bird’s foot trefoil, buttercups and red bartsia can still be seen if you look carefully, but we particularly liked the ribbed melilot shown below. Autumn meant that the MCT open meeting took place at the Marriott Hotel Management Suite on Tuesday 16th September. 26 folk turned up to hear about what MCT had been doing on the wild flower meadow, woodland, paths and fence and why things were being done the way they were. 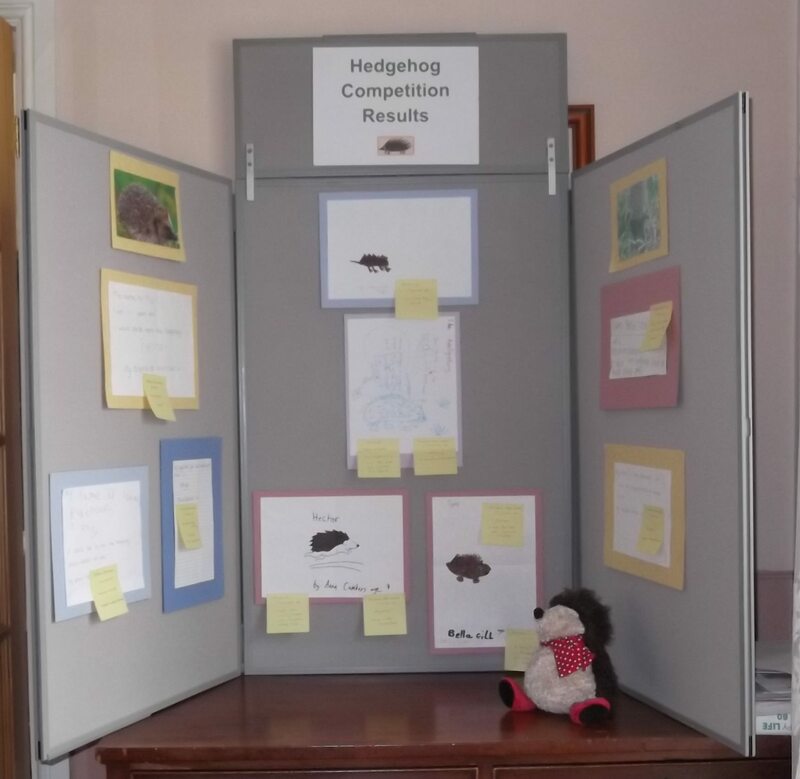 The slide show of 60 wild flowers photographed on the Mayfields site north of Nelsons Lane over the year proved very popular, but not as popular as the results and prize awards for the Hedgehog competition! We’re very grateful to the Marriott Hotel for providing such excellent facilities to help a local Trust. 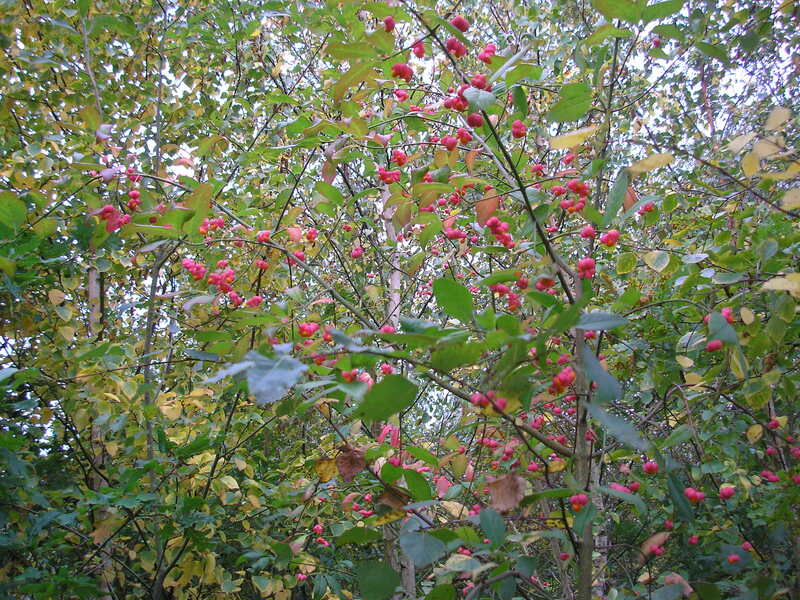 Really though Autumn is a season for blackberries and rose hips, which have been plentiful around the site. 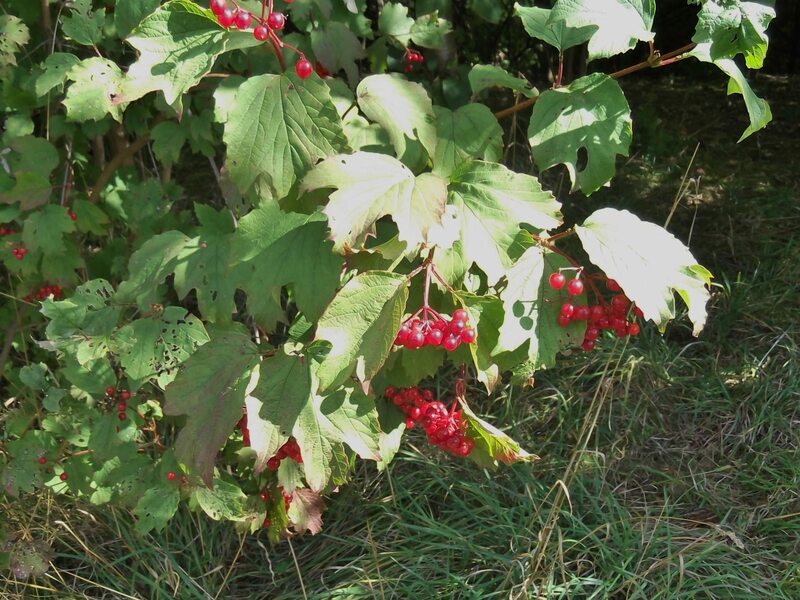 We thought the white dogwood berries, guelder rose and hawthorn berries on the site justified pictures here. You can see the red colouration starting to show on the new growth on the dogwoods trimmed back earlier in the year. It should provide a good winter show later.